I'm pretty sure I've sen it reported that dwarves will carry a minecart loaded with magma up stairs, and do so with no damage. It was probably earlier in this thread, or else in the "Minecarts are for what? No, really." thread. 1. A dwarf who carries minecart with magma will have his hands melting. In some turns nothing happens while in another turn you get "You are melting" x100 type of messages. In all tests the dwarf carrying the magma minecart will bleed to death after about 30 moves. But since the minecart with magma is very heavy, the dwarf carrying it moves at 1/10 speed (99 in adventurer-speed-units). So in other words he WILL die after about 300 of typical-dwarf turns. 2. Making him wear Steel Gauntlets or any other handwear doesn't help all, he still dies after about the same time. You will only get the melting injuries for one turn (possibly from the fact that you had to grab the magma minecart for one turn to put it into the other minecart). After this the little hand burns you got will quickly heal and the dwarf won't get any further burning injuries. He can carry the double minecart with magma for long time without any issues. Are you sure you had temperature enabled? 1. Have the short track passing through magma to load minecarts with magma. 2. Have minecart stockpile very close (so dwarves dont touch magma minecarts for too long). 3. Unassign the magma minecart from the track so they get put into stockpile. Even better: you can make the magma loading track in such a way that minecarts end their way in minecart stockpile automatically. 4. Have a hauling route with 2 stops between which you want to move the magma. Have the first stop take furniture->minecarts from the magma minecarts stockiple. Have the final stop drop the contents into another minecart stockpile. 5. Assign some empty minecart to this route, have it loaded with magma minecarts, then moved and unloaded at destination. One minecart can contain 12 other minecarts! It is because minecart capacity is 50000 while its size is 4000 - size only takes into account volume of material the object is made from, not the actual dimensions of the object. 6. Now you have stockpile with magma minecarts near the destination. Build a track stop that dumps its contents where you want the magma to be placed. 7. Make several hauling routes with one stop at the target track stop and assign magma minecarts to the routes. Distance between the final minecart stockpile and the track stop must be small (so dwarves dont touch magma minecarts for too long). 8. Have the dwarves drop the magma from the minecarts. 9. Bonus if you assign dwarves who with high strength, toughness and recuperation to hauling magma minecarts at the 3. and 8. Strength will minimize the time it takes them to haul the minecart so less chance of them dieing. This may seem like a lot of work, but if you want just a few magma tiles near the surface for your workshops, this is less work than designating 100z-levels of spiral minecart track. Guiding the minecart doesn't result in damage. At the time, I also tested in the arena (the same things that you tried). However, fort mode dwarves have access to a special way of moving the carts that adventurers can't do. If you try riding the cart, for example, you will find that you are undamaged. Guiding it is similar. Overall, this thread has lots of useful information hidden on the earlier pages. In fact, it was created so that people would be able to find information before they have to ask the question. Maybe the wiki is a better place for that then a thread. The point of my testing was specificially HAULING of the minecart with magma. Not guiding, pushing or riding, because they all these require you to build a complex track across many z-levels. And yeah I know it was tested earlier in this thread that guiding doesn't hurt dwarves while hauling does hurt them. But noone have found a way to make hauling of magma minecarts safe without the need for a track. While I did. Took joy in ‼SCIENCE‼ lately. Your fortress is blind and crippled and you have nowhere near the military strength to break a siege. Don't you see? The Fun was inside you all along. The whole design can even be completely automated! Without the need to assign and unassign minecarts to different tracks at a time. 2. There is a hauling route with one stop on X, with assigned vehicle, set to take furniture->minecarts from stockpile aaaaa. 3. Empty minecarts are put into the minecart on track stop X, the track stop dumps them to the left, placing them on the rollers. 4. Rollers move the empty minecart into the magma reservoir, they get filled with magma, then the roller on ramp moves them up, they follow the track, then go out of it and stop at the wall, effectively the minecart with magma is being placed stockpile bbbbb. 5. Stockpile ccccc is set to take from stockpile bbbbb and has assigned 3 wheelbarrows. Dwarves savely transport the minecarts with magma inside wheelbarrows into the surface into stockpile ccccc. 6. There is a hauling route with one stop on Z, with assigned vehicle, set to take furniture->minecarts from stockpile ccccc. 8. Rollers move the magma minecart along the track, they pass through the track stop S and dump the magma in the destination point U, then they follow the track, go out of it and stop at the wall, effectively the emptied minecart is being placed stockpile ddddd. 9. Stockpile aaaaa is set to take from stockpile ddddd. Dwarves haul the empty minecarts back underground near the magma into stockpile aaaaa. Then we go back to start and the whole think repeats. 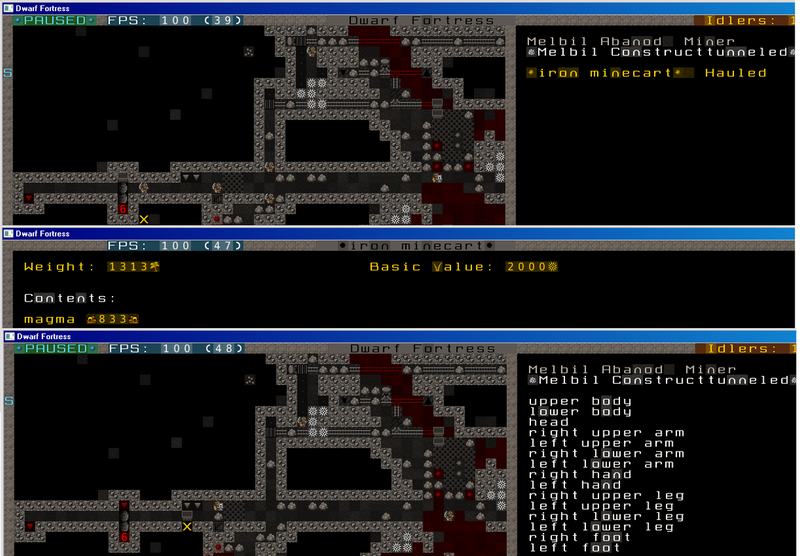 I did a quick test and dwarves happily move minecarts inside wheelbarrows between minecart stockpiles. At the time, I also tested in the arena (the same things that you tried). However, fort mode dwarves have access to a special way of moving the carts that adventurers can't do. Even a dwarf armed with axe, one iron shield and six crying shields can haul one additional item, because they use telekinetic powers given to them by fortress collective mind. I like your idea of automatic dumping carts on to rails though. Ok, thanks for the info then. I quite followed this thread from the start but obviously I could skip or forget some stuff people mentioned. Still I had a lot of creative fun while thinking about my design. - Dumping carts onto rails, or having them move from the track directly to the stockpile should save some micromanagement of creating many hauling routes with one minecart each. - Having the minecarts being moved inside wheelbarrows should make their hauling MUCH faster. They are very heavy when full and dwarves move at about 1/10 speed when hauling full minecart. With wheelbarrow they would move at full speed. Maybe it's time thread OP make an update. That automated wheelbarrow magma minecart hauling method basically fixes my longstanding problem of not being able to easily (and without FPS drain) get some magma to the surface. Not only that, it makes delicious use of non-Euclidean Dwarven geometries to hold objects larger that other objects, inside those objects. Also magma is being carried in a wooden wheelbarrow essentially. Perfect. I have a few small discoveries regarding minecart rides. 1.Dwarves can admire buidlings while riding mine carts. 2.Dwarves will not fall asleep during a ride (at least not from being drowsy). 3.If riding on a continuous powered track loop, the dwarf will die of dehydration/starvation as they can not jump off to get sustenance. Well, that teleportation thingy grieves me deeply. It provides neither means for teleporting dwarfs, nor ways to hurt creatures behind the wall. I had observed the phenomenon when high speed cart was running over down ramp it was meant to follow. Cart enters from right. Instead of going down it appears to the left of the wall at zero speed, all contents are dumped on ramps. During the piloted run, the volunteer was hit by the cart while above the ramp then collided with wall and floor consequently. While experience was unpleasant at best dwarf got away with a pair of bruises and broken wrist which is something unexpected considering that dwarf bumped by cart of this speed and mass would leave a long trail of brains in tunnel. The fact that rider happened outside the cart suggests that the collision with a wall takes place. Based on faster than light carts theory I could suggest that cart gets placed around .51 in the wall during its flight which causes collision to occur. Speed is set to zero but coordinate rounding up causes the cart to be placed on the other side. This doesn't rules out the possibility of warping through the wall without collision but it means the speed must be even higher. This behavior was observed on 14 z-level slope with galena filled lead cart weighting over 4000 urists total. Mass is relevant since 500 urists cart will get airborne in only 6 levels of acceleration. Also, I've sometimes noticed galena boulder ending up in the same tile as cart, but I can't say if they teleported or got there by other means. Probably needs a summary thread at some point in the Wiki. Perhaps as "Minecart Talk" being presented by Urist and Urist, the HammerIt Bros. I've been trying to set up a supply route that starts at my masons workshops in the mountain, goes to my furniture stockpile, then goes to my construction site outside. However, I can't get the settings right because there seems to be no way to send a minecart off only after its empty of a certain type of item, while there are still other items in it. I've been settling for a timed delay but this is really annoying.